A series of attacks by the outlawed Islamist militant group Boko Haram has killed at least 74 people and injured hundreds in northern Nigeria. Police say in the first attack on Saturday, two bomb blasts killed at least 35 in the northeast city of Maiduguri. 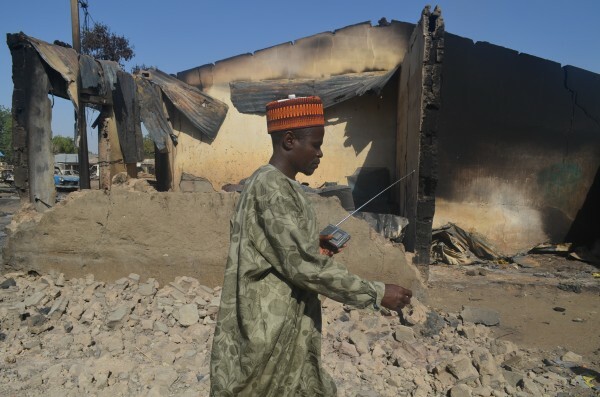 In Mainok, a village also in the northeast, armed Boko Haram fighters killed another 39. In the last month, Boko Haram attacks have killed nearly 300 people. Last week, school children were among those killed near the northeastern city of Damaturu. In the past two weeks alone, Boko Haram have burned to the ground at least 1,500 buildings and destroyed hundreds of vehicles. Last month, Nigeria’s Northern States Governors Forum called on the government to do more to curb violence after fresh fighting between suspected Boko Haram militia and villagers left over 18 dead and hundreds injured in the northeastern province of Borno past week. Boko Haram debuted on the Nigerian stage in 2002 and has been calling for an end to secular-based law, to be replaced with Islamic Sharia law. It has been fighting government forces and raiding villages ever since.